Our range of products include under vehicle scanning recording system. Under Vehicle Scanning Recording System is a specialized unit which can be is used worldwide in the fight against smuggling and terrorism, where detection of concealed explosives,weapons, drug, etc. is the objective. This unit offers excellent security when there is a requirement to view under vehicles. 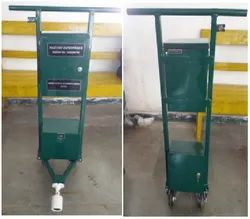 Our provided under vehicle scanning recording system is featured with a camera, this portable tool is suitably used in search operations of vehicle wheels and underlying flat surface, where human intervention is not possible. It has capacity of storing the images for more than 1 year. It has battery backup of more than 12 Hrs. It can record in night conditions because of Night vision cameras. Lowest cost and highest flexibility. Capture clear, color and well contrasted images of vehicle underside at the time of vehicle checking. Provides a high resolution stitched image of the underside of the vehicles. You can view & record all types of vehicles with this. Efficient viewing and recording is possible with UVSRS. The under vehicle scanner ensures quick detection of foreign items e.g. explosives, bomb etc. The UVSRS is a crucial time saver. Facility to view & recording in Night Condition. Battery back for more than 12 Hrs. UVSRS helps to improve the security by effectively preventing the risks of bombs, weapons. 1/3 Inch CMOS Camera with 720P Resolution. MS Powder Coated body with locking facility. Battery Backup with charging facility with indication. Recorder with recording facility for more than one year. Looking for Under Vehicle Scanning Recording System ?